Since April 13, 40,000 workers, represented by the Communication Workers and the International Brotherhood of Electrical Workers, have been on strike against Verizon in Washington, D.C., and nine East Coast states from Massachusetts to Virginia. There are many issues of contention, such as company plans to freeze pensions, reduce health benefits, eliminate jobs including through outsourcing and offshoring, and force workers to relocate away from their families. The two unions, which represent workers doing similar work in different parts of the country, bargain jointly with the various phone companies. Both turned down Verizon’s proposal flat-out and made a counter-offer. “Veri-greedy” refused to consider the unions’ proposals. Now workers are hunkering down to fight it out as long as it takes to win contract justice. Very few union members have crossed the picket lines. Verizon aims to have the public and rank-and-file workers believe that the most recent offer contains significant improvements. The company that cries poverty about paying for health care managed to come up with the funds for full-page ads in newspapers up and down the East Coast. Executives sent individual letters to workers trying to get them to agree to the company’s offer. They were sent via non-union FedEx rather than UPS or U.S. mail. Verizon CEO Lowell McAdams has personally visited picket lines, including one in the Syracuse suburb of DeWitt, N.Y., to try to win strikers to the company’s side. 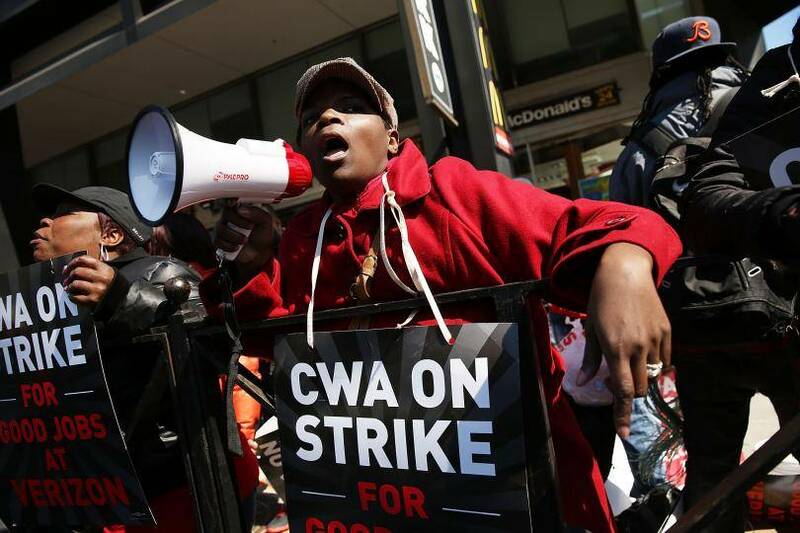 CWA District 2-13, representing strikers in Pennsylvania, Delaware, Maryland, D.C. and Virginia, has picked apart the company’s position point by point. (district2-13.cwa-union.org) Verizon offered another 1 percent in pay raises over the life of the contract, but the raise will be eaten up by bigger out-of-pocket health care costs. Workers will also face increased transportation costs in a new modification of “forced relocation,” a major sticking point. Under this plan, workers could be subjected to long and costly commutes, but would not have to live elsewhere. As a bribe, the company’s latest offer would withdraw the forced relocation language if workers ratify the rest of the giveback package by May 20. Verizon’s offer still has numerous rollbacks of union gains, including reductions in pensions, paid leave and disability benefits. Job security will be undermined by new “flexibility” language, the closing of call centers and outsourcing of more jobs overseas. (The company already offshores 5,000 jobs.) Injured workers could have more trouble collecting workers’ compensation. Nevertheless, the fact that the company sweetened the pot a little is testament to the strike’s effectiveness. Polls are showing public opinion of Verizon service is falling, as untrained managers and hired strikebreakers are proving themselves incapable of maintaining service or making repairs in a safe or timely manner. Signs are appearing in café windows informing customers that no Wi-Fi is available. Doctors’ offices cannot make appointments due to lack of internet service. Poor service is driving customers away. Support actions are taking place in states where there are no strikes. In Durham, N.C., members of United Electrical Workers Local 150 and Raise Up 15 picketed and leafleted outside a Verizon store in a shopping mall. They then took their protest inside the mall. Before they could reach the Verizon store, they were escorted out by security guards, but continued to chant on the way out. Black Workers for Justice is planning a solidarity action in Raleigh, N.C.
Dante Strobino and Steve Kirschbaum contributed to this report.